Wall drainage and additional heat insulation in the basement and floors, at roofs to improve water drainage and provide microventilation. Microventilation in floors at roofs. 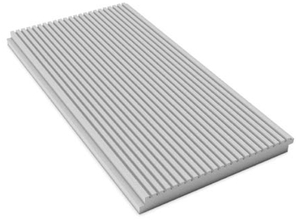 TECHNONICOL XPS 35 300 CARBON DRAINAGE slabs should be stored sorted by brands and dimensions, in a dry closed place, horizontally in piles at a distance of not less 1 m from heaters. The piling type arrangement should provide stability when storing and dismounting slabs. The piling height should not exceed 5 m. The width of spaces between piles should be not less than 1.5 m. TECHNONICOL XPS 35 300 CARBON DRAINAGE slabs should be stored under an awning, protecting the magainst atmospheric precipitation and sunlight. When storing under an awning, the slabs should be laid on pallets or linings.